We are here to help you, if you or a loved one has been injured in a car accident. If you’re reading this page, chances are you have recently been in a car accident and are wondering if you need a car accident lawyer. You probably have many questions right now. Over the past century, a vast and complex bureaucracy has grown around car accidents. There are many players in this bureaucracy, and few of them have your best interests at heart. Insurance representatives, police officers, and medical professionals may have the best intentions, but often leave you with more questions than answers. And some, such as the other driver’s insurance adjusters, will be openly working against your interests. What none of these people will tell you is that after a car accident, you are not as powerless as you may think. There are some things you can do to improve your situation, and we will share them in this guide. Click here for a downloadable, printable version of this guide. The United States has one of the highest rates of car ownership per capita in the world, at 910 cars per 1,000 people. Cars are a major factor of everyday life in the U.S., but this dependence comes with a downside. Most Americans will be involved in a car crash at some point in their lives, and for many, these accidents will be deadly or otherwise life-changing. In 2017, there were over 7 million car accidents on American roads. According to the National Highway Traffic Safety Administration’s (NHTSA) National Statistics, that rate has risen each year since 2011. More than 3 million Americans were seriously injured and more than 37,000 are killed. The attorneys at TorkLaw have dedicated their careers to helping car accident victims. Read on, and we will tell you everything you ever wanted to know about car accidents, but were afraid to ask. The largest cause of motor vehicle accidents, by far, is driver error. 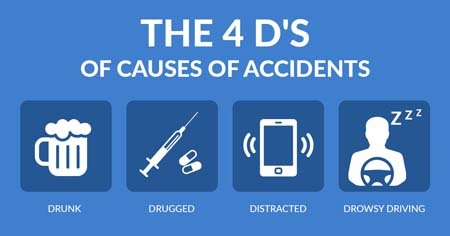 Most are caused by one (or more) of “the four Ds”: drunk, drugged, distracted, and drowsy driving. Other major driver errors include speeding (driving faster than the speed limit OR than is safe to under current traffic and weather conditions), and disobeying traffic signs and signals, such as red lights. A few groups, including young men, are known to be particularly risky drivers. However, all humans are imperfect, and anyone can make a serious and regrettable mistake on the road. Some car accidents are caused by defects on the roadway. In these cases, an accident can occur even if none of the drivers did anything wrong. If these factors caused or contributed to your accident, you may be eligible to sue the government agency (typically a city, state, or county agency) responsible for designing maintaining the roads so they remain safe. Sovereign immunity, a centuries-old legal doctrine stipulates that the government (the “sovereign”) cannot be sued. Local governments tend to waive their right to sovereign immunity in roadway defect lawsuits, so you can still sue, but it’s made harder in several ways. There may be a requirement that the roadway defect involved gross negligence, not just ordinary negligence. There is usually a short statute of limitations for such a case, typically six months or less. If you have a defective roadway claim, it’s helpful to hire a lawyer and important not to waste any time. Some accidents are caused by a flaw with the vehicles themselves. This is less common, although as self-driving cars and automotive features become more prevalent, vehicle defect lawsuits may become more prominent. Any component of a motor vehicle can be defective. Some of the most dangerously defective components in past cases have included seat belts, airbags, steering wheel, ignition, fuel system, acceleration and braking system, and tires. Dangerous defects are certainly not limited just to these components. Vehicle defects may include design defects, manufacturing defects, or even labeling defects (if the company that made the vehicle did not warn consumers of a particular risk). Car manufacturers are usually held liable for defects, although parts manufacturers, shipping companies and car dealerships can also be included in such a lawsuit. Defective vehicle liability lawsuits fall into the realm of product liability law, which makes them different from ordinary car accident lawsuits in several ways. For one, they are subject to the tort of strict liability, which means that the plaintiff does not need to prove negligence. Under the strict liability standard, the plaintiff merely needs to show that the vehicle had an unreasonably dangerous defect, that it occurred when the vehicle was being used in its intended way, and that the vehicle had not been modified substantially. For another, it is likely that a defect in a mass-produced car will affect many different drivers, which makes it much more likely that a vehicle defect lawsuit will expand into a class-action lawsuit involving many plaintiffs. 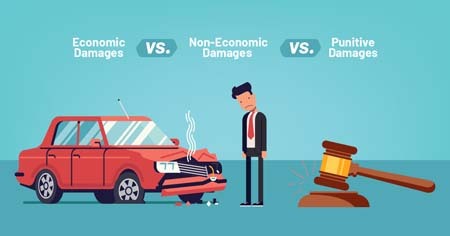 Finally, plaintiffs in defective vehicle lawsuits are likely to obtain high punitive damages, which are sometimes awarded to dissuade car companies from using inhumane cost-benefit analyses to determine that fixing a defect is costlier than the lives of the people who are injured or killed by the defect. Some accidents are caused by a poorly maintained car. This is different from a defective vehicle case because the vehicle was safe when sold, but was not maintained properly by its owner. Drivers are responsible for maintaining their vehicles and making sure that all the basic systems are in good working order. If they fail to do this, and it leads to an accident, they can be held responsible. Drivers aren’t responsible for every single vehicle malfunction, but they may be held liable if they had adequate warning, or should have known about a problem with the car, and did nothing to fix it. However, if the driver took the car to a mechanic and they failed to properly repair it, the mechanic may be held liable. Sometimes inopportune medical emergencies cause drivers to lose control of their vehicles and crash. Such medical emergencies may include heart attacks, strokes, seizures, fainting spells, or even sudden schizophrenic episodes. Can drivers be held responsible for medical emergencies? It depends. If it truly was unforeseen, they may invoke the sudden medical emergency defense. However, if the driver had some warning, such as a history of similar episodes or a doctor’s diagnosis, they may be held liable. Dangerous weather can play a role in car accidents. Fog and precipitation can impair visibility. Rain, snow, and ice can make roads slippery, which increases the risk that a car will go out of control. Even high winds can make it harder to control your vehicle. Accidents are also more likely to occur at night. Drivers have a duty to respond to dangerous weather conditions by driving more slowly and carefully, using headlights, and taking other necessary precautions. If they fail to do so, they are at fault and legally liable. Some animals, such as moose, elk, or cows, weigh as much as a car. A collision with such a large animal could kill or seriously injure the occupants. 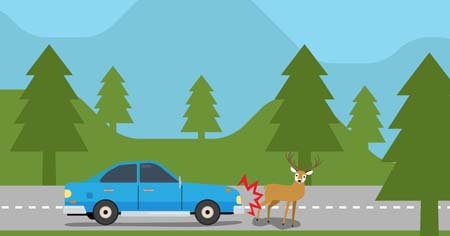 A collision with a wild animal is an “act of nature,” and no one can really be held responsible. But a collision with a large domesticated animal may be a different matter. Farmers and ranchers have a duty to secure their livestock properly, and can be held liable if their livestock cause an accident. Single-vehicle accidents are one of the most common types of car accident, responsible for around 54% of car accident deaths in the United States in 2016, according to the Insurance Institute for Highway Safety. Colliding with a tree, building, barrier, or other stationary object. They can range in severity from minor to catastrophic. Most single-vehicle accidents are directly attributable to driver error, and can be easily prevented by driving attentively, avoiding risk factors like the four Ds, and being careful on dangerous roads or harsh weather. This means that in most cases the driver in a single-vehicle accident will be completely at fault, and unable to sue anyone for damages. There are exceptions, such as cases involving roadway or vehicle defects. Passengers and pedestrians injured in single-vehicle accidents may also file a claim against the driver. Rear end accidents are the most common type of multi-vehicle accident. They involve the front of one car striking the rear of another car when both are headed in the same direction. Rear-end accidents are usually the fault of the rear driver. Drivers are required to maintain a safe following distance from the car ahead of them, so that even if that car slows suddenly, the driver in the rear will have time to stop. 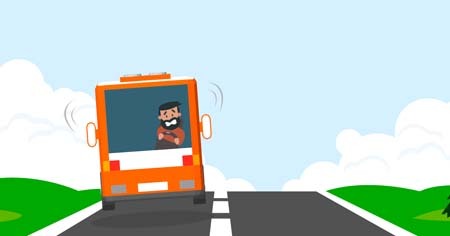 There are a few situations in which the driver in front may be found at fault, including if they switch lanes in front of another car and then brake suddenly. In fact, this is sometimes done as an insurance scam. However, this is a small minority of rear end accidents. Rear end accidents, while common, are not the most serious type of accident. Unless they occur at high speeds, or involve large vehicles, the occupants of the vehicles involved usually escape with only minor injuries. Whiplash, however, is common in rear end accidents, and can result in serious complications. Left turn accidents are the second most common type of multi-vehicle accident. They occur when a driver is struck by oncoming traffic when making a left turn. In left turn accidents, the left turn driver is usually at fault. Cars have a duty to yield to all oncoming traffic when making a left turn. However, if the car that hit the left-turning vehicle was speeding or driving recklessly, or driver ran a red light or stop sign, then that driver may be at fault. If two cars turning left collided, fault is determined by right of way. Left turn accidents can range in severity. Because occupants of cars have less protection on the sides of the vehicle than in the front or rear, these types of accidents can be extremely serious. Left-turn accidents which involve the front of one car hitting the side of another are often referred to as T-bone accidents. However, not all T-bone accidents involve a left turn driver. Some may involve two drivers attempting to go straight at an intersection. In these accidents, fault will be determined by right of way. Head-on accidents are a relatively rare type of accident, but they are among the most serious. They involve the front ends of two cars, coming from opposite directions, colliding directly with each other. In a head-on accident, the driver who was driving against the designated direction of traffic is at fault. However, fault can be difficult to determine, because head-on collisions often involve so much force that both cars spin off in different directions. In these cases, accident investigators may not know which car was driving the wrong way, and may rely on witness testimony. The at-fault driver in a head-on crash is frequently asleep, drunk, drugged, or suffering a serious medical emergency, but this isn’t always the case. Sometimes all it takes is a moment of inattentiveness for one driver to drift into opposing lanes on the highway. 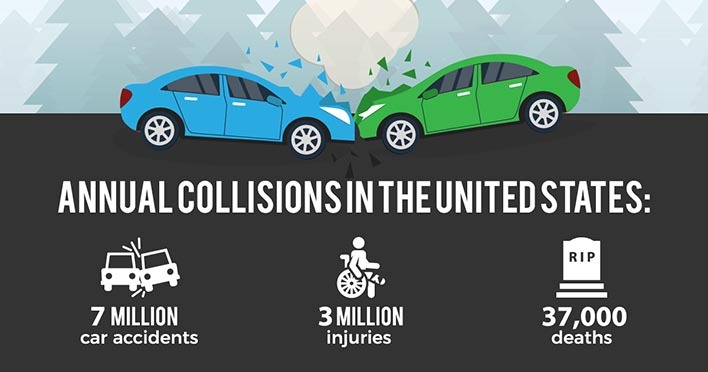 Because both cars are typically traveling at full speeds, and because the drivers are in the front of the vehicle, head-on collisions cause a large share of the traffic deaths and catastrophic injuries. 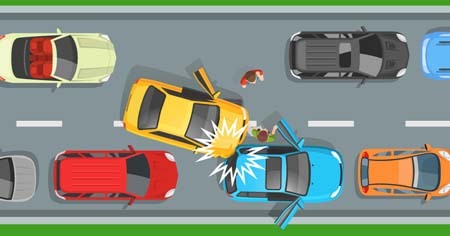 Another common type of accident is the lane change accident, which occurs when a driver makes a lane change and collides with another car in the new lane. Typically, fault in such an accident lies with the driver making the lane change. Rear-end accidents in heavy traffic may sometimes grow into multi-vehicle pileups. These crashes can involve dozens of vehicles and injured parties, and determining fault in such a large-scale event can be exceedingly difficult. There are other types of accidents listed on our Practice Areas page. Just because you don’t see your accident mentioned here doesn’t mean you don’t have grounds for a claim! Take a look at this list of uncommon accident types. Click here for a downloadable, printable version of this file. Typically, car accident injury cases are decided in the civil court system. The civil court system is different from the criminal court system, although the two are sometimes confused. Criminal courts are designed to punish lawbreakers through some form of state sanction, including fines, community service, or prison time. Civil courts, on the other hand, mete out justice by making wrongdoers pay monetary damages to their victims. Unlike in a criminal trial, where the prosecutor is the state, civil cases involve individuals or entities (such as corporations) suing each other. Some actions by drivers, including hit-and-run, driving under the influence, and vehicular manslaughter, are criminal offenses. However, car accident lawsuits are tried separately. Car accident lawsuits fall into the subset of civil law known as personal injury law or tort law. (“Tort” simply means a civil wrong done to one party by another.) They are the most common type of personal injury lawsuit. In a personal injury case, the injured victim is known as the plaintiff, and the person against whom they file the lawsuit is known as the defendant. If you use TorkLaw or another firm to represent you in a case against an at-fault driver, then you will be the plaintiff. When you bring a civil case against another driver, you must prove that they are guilty by a preponderance of the evidence. This means that it must be more likely than not that they were guilty. It is a much lower standard than proof beyond a reasonable doubt, which is used in criminal trials. Although car accidents are a legal matter, filing a claim against another driver’s insurance is not the same as suing. Nor is hiring a personal injury attorney. Most of the time, you and your attorney will resolve the matter with the other party without having to formally file a lawsuit. Even once a lawsuit is filed, most cases are settled before going to trial. In fact, it is estimated that over 95% of personal injury cases settle before going to trial. Even if your case does not go to court, the standards for demonstrating the other driver’s negligence will be the same. Both parties know that the case could go to court if negotiations break down, and so the side with stronger case is likely to have the more favorable outcome in the settlement agreement. In most cases, the threat of a lawsuit is enough. Damages are the primary objective of any personal injury case. They are compensation for the loss you have suffered, and take the form of a direct monetary award to the plaintiff. If you win a personal injury lawsuit as a plaintiff, the court will award you the damages. If you settle with the defendant, they will pay you an agreed-upon sum. Punitive damages, which are meant to punish a particularly egregious act on behalf of the plaintiff. In the event of a car accident, the at-fault driver’s liability insurance covers the bodily injury and property damage claims of the other parties involved. Drivers in every state (except New Hampshire) must have liability insurance. Each state has its own legal requirements, which are often formatted as three numbers, separated by slashes: California’s minimum mandated insurance is 15/30/5. The first number, 15, is the required bodily injury coverage per person. In California, drivers must be insured for at least $15,000 for each person injured in the accident. The second number, 30, refers to the total required bodily injury coverage. In California, drivers must be insured for at least $30,000 for all people injured in an accident. The total-accident limit is a final cap on the per-person limit. If several people are injured in an accident in California, and their collective damages total more than $30,000, they will not be able to collect more than $30,000 between them, even if their separate claims did not exceed $15,000 each. The third number, 5, refers to property damage coverage. In California, drivers must be insured for at least $5,000 for any property damaged in an accident. Make sure have minimum coverage levels required by your state. If you are caught driving uninsured, you may face heavy fines and a suspended license. And, if the injured parties’ damages are greater than the at-fault driver’s insurance limits, they may sue the driver directly. If you were injured in an accident with an at-fault driver, you must file a claim with the other driver’s liability insurance company, and deal with the insurance claims adjuster for that company. Insurance adjusters may refer to themselves as “claims representatives” or “claims handlers,” or something similar. Typically, they are insurance company employees, but may be independent contractors. Their essential function is to negotiate with you and attempt to settle your claim. Their job has two basic incentives: to settle a claim as quickly as possible, for as little as possible. Insurance adjusters may be aggressive and try to intimidate you, but it is more likely that they will be friendly, and act as though they are on your side. No matter how they behave, the insurance adjuster’s goals are not aligned with your own. If an accident victim’s claim is particularly complex, you may end up speaking directly to other insurance company’s lawyers. If this happens, you will need your own lawyer to make sure you receive fair treatment. There are a few other types of car insurance which you may need to know about, aside from liability coverage. Personal Injury Protection (PIP), is another form of coverage that is either available or required, depending on your state. In “no-fault” states, injured parties collect from their own insurance company, regardless of who was at fault. This insurance pays for things like medical bills and may also include coverage for lost wages, substitute services (i.e., household help) and funeral expenses. “Medical Payments to Others,” or Med Pay, covers medical costs for passengers injured in your vehicle, regardless of fault. Unlike PIP, there is no deductible with MedPay. However, MedPay only covers medical expenses, not lost wages, substitute services or funeral expenses. UM coverage is meant to protect you if you are in a crash with an uninsured motorist or a hit-and-run driver who cannot be found. It may cover property damage, bodily injury, or both. UIM coverage is closely related, but it covers damages in a crash where the other driver was not sufficiently insured to cover your full losses. UM/UIM coverage are required in some states. Even if they are optional in your state, they are worth the money. This insurance covers the cost of your car if it is damaged or destroyed in a collision or by another factor, regardless of fault. They are optional in every state, but are still useful, unless your car is not worth much. Duty: The defendant had some duty to you, such as the duty to drive safely and obey traffic law. Breach: The defendant breached this duty by breaking traffic law or otherwise driving unsafely. Damages: You suffered losses, or damages, because of the accident. Cause: The plaintiff’s breach of duty was the proximate cause of your damages. In some cases, negligence is easy to prove. The plaintiff must simply show that the defendant violated some traffic law (such as running a red light), and that this violation led to the accident. This is known as negligence per se. In other cases, negligence is more difficult to prove. The plaintiff must prove that the defendant’s conduct was not that of a “reasonable person.” However, there is significant legal precedent defining what constitutes “reasonable” driving. Some actions, such as fleeing police or street racing, are so egregious that they go beyond mere negligence. These actions may be tried under the torts of gross negligence or recklessness. These cases are typically easier to litigate than ordinary negligence claims. A few types of car accidents involve intentional tort claims, but this is rare, since most people (except in extreme circumstances) do not intend for car crashes to happen. The defendants can all be sued at once, and if they are found liable, then they will be made to share the damages between them. The process of arranging for the defendants to share damages can be complicated, and different jurisdictions have different rules on how this is done. Some states assign damages according to the doctrine of joint and several liability, under which all parties share the total responsibility for the damages. This is controversial, because it can lead to clearly inequitable situations in which a party who shared only slight responsibility, but had the greatest ability to pay ends up shouldering most of the burden. Other states simply assign damages proportionate to the degree to which each defendant was at fault. If one defendant is deemed to be 50% at fault, then they must pay 50% of the damages, and so forth. This avoids the pitfalls of joint and several liability, but it can make it hard for the plaintiff, because if even one defendant lacks the ability to pay their share, then the plaintiff will recover less than the full amount. You can still receive damages, but they will be diminished according to the rule of comparative negligence. 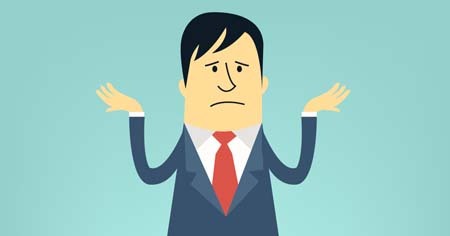 Comparative negligence functions a little differently in every state, but the basic principle is always the same: if a plaintiff was partly at fault then their damages will be awarded at a reduced rate, proportionate to the degree to which they were at fault. For instance, let’s say that a court decides that the defendant in a case was 80% at fault, but the plaintiff shared 20% of the fault. In this situation, the defendant will only be required to pay 80% of the damage. In the immediate aftermath of a car accident, you are typically distressed, and your system will be flooded with adrenaline. This will make it hard for you to think clearly. Nonetheless, it is imperative for your health and legal well-being that you take the following steps after an accident. The first and most urgent thing to do after an accident is to get out of traffic, especially if you are on the highway or a busy street. If your car is drivable, pull to the side of the road and turn the engine off. Don’t drive any further than needed to find a safe place to stop, or you might be accused of hit-and-run. If you can’t drive your car, then turn on your emergency blinkers. If it is safe to do so, set up flares, cones, or emergency reflective triangles a distance behind your car, to let other drivers know that there has been an accident. However, don’t do this if it doesn’t feel safe! Be extremely careful about walking in or near the road after an accident. Check on the people in your vehicle as well as outside or in other vehicles. If someone is injured, call the police immediately, even if the injuries seem minor. Check yourself too; adrenaline can mask injuries. Let the paramedics handle the injuries. Don’t attempt to move any severely injured or unconscious people, unless they are in danger of being hit by traffic. If there is a serious medical emergency, then perform first aid, if you are certified and you know what you are doing. Always stay at the scene of an accident until you are legally authorized to leave. Otherwise, you may be found guilty of hit-and-run, even if you were not at fault. Hit-and-run is a serious crime in every state, and typically a felony if someone was injured or killed. The requirements vary from state to state, but typically, you must exchange your contact information with any other parties involved, including name and residence address, driver’s license, and proof of insurance. If you collided with a parked vehicle or another object, then you must leave a conspicuous note with this information. If anyone was injured or killed in the accident, you must call the police. You should also call the police if there was significant property damage. If there was only minor property damage and no injuries, you may be able to report the accident to police later. Finally, you must provide emergency medical aid for any injured people. When you are exchanging license and insurance information with the other driver, say as little as you can; stick to the formalities. There is absolutely nothing to be gained from discussing the accident at the scene, and a lot to lose. Do what you’re legally required to do, and no more. Most importantly, do not apologize to anyone. It’s natural to say, “I’m sorry,” as a matter of politeness, but legally, this can be interpreted as an admission of fault on your part. At the same time, don’t react with anger or aggression, even if you are upset. Just keep quiet for the moment and let your insurance company and your attorneys deal with them later. If the police come, however, you should talk to the officer, to make sure your version of events is included in the police report. 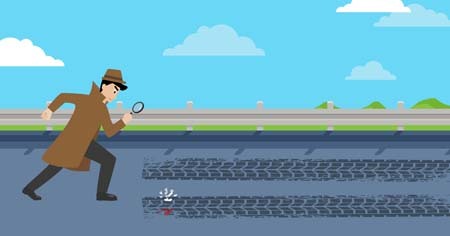 One of the best things you can do for your case, if you are able, is to gather evidence at the accident scene. If you’re severely injured, don’t push yourself unnecessarily, but you may ask someone you trust to gather evidence for you. Take pictures of the accident scene, including your car, the other car (and license plate), the damage to both cars, and your injuries. Talk to any witnesses who are still present at the scene of the accident, and take down their contact information. After the accident, it may also help to write down a few notes about what happened, while the details are still fresh in your mind. If the police come, then get the officer’s name, badge number, and business card. If you cannot drive your car after the accident, it will have to be towed, especially if your vehicle is in the middle of traffic. Towing can be expensive. If your insurance (or AAA membership) covers towing, then it is best to call them first and have a trusted towing company move your car. No matter who called the tow truck, ask for the driver’s business card once they arrive. Overnight storage fees add up quickly, so if you have a trusted mechanic nearby, you can request that your car be taken directly to them. Request that the mechanic not touch the car until the insurance companies have had a chance to examine it. Otherwise, don’t leave your car in the tow yard for too long after the accident. The final towing bill will be assigned based on the determination of fault. Sometimes, accident injuries that seem minor may be more serious than you may initially believe. Many injuries have delayed symptoms. Medical expenses are one of the most important components of a personal injury case, and to prove these damages in court, you must provide medical records to show you were injured. The best time to get these is the day of the accident. If you do not see a doctor the same day, then the defense will try to say that you must not have been that badly injured. Don’t give them that opportunity! You are required to call your insurance company as soon as reasonably possible and inform them that an accident has taken place. You should also report the accident to the police if they did not respond to the accident, and depending on your state, you may have to report it to the DMV or other agencies as well. If the police responded to the scene, they will have filed a police report on the accident. This report will include a determination of fault, which can influence the insurance companies’ actions, and their own, separate determination of fault. You should order a copy of your police report once the final draft has been filed (which may take a few days). The police report might require a nominal fee to order, although you can order a free copy through TorkLaw’s website. The police are not perfect, and they usually have many reports to complete, so sometimes they make mistakes. 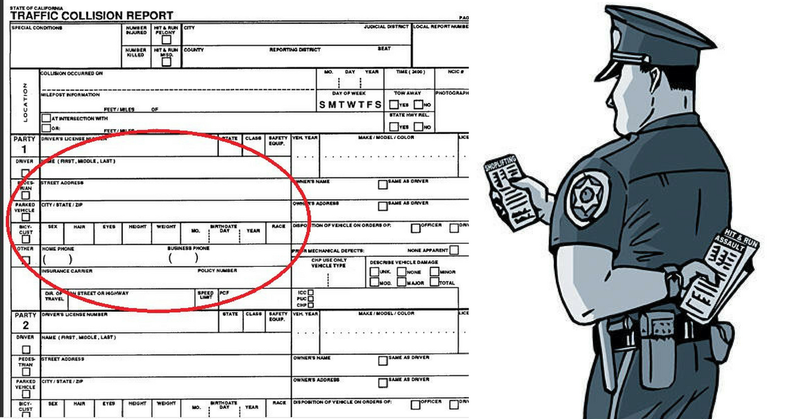 If there is a mistake in your police report, you may petition to have it corrected. Even after leaving the scene of an accident, you should be careful what you say in public until your case is resolved. 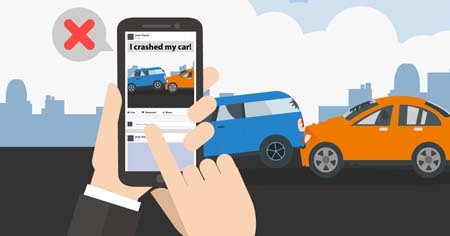 Don’t post anything on social media about your accident or injuries, or provide details to acquaintances. It can be tempting to make a post letting your friends know that you are okay, but Facebook and other social media are public forums, and insurance companies may take “I’m doing okay” as an admission that you are not injured. Even posts that have nothing to do with your accident (such as outdoor or vacation pictures) can be used as evidence that you were not seriously injured. Finally, don’t talk to the other driver’s insurance company, and don’t consent to be recorded under any circumstance. You are not under any obligation to do so. You can talk to your own insurance company, but do not speak to the other side’s adjusters without an attorney present. What If I Was a Passenger? It is very common for passengers to be injured in an accident, and if this happened to you, you have the right to file a claim with the at-fault driver and seek damages for your injuries. Legally, you cannot be at fault as a passenger, unless you did something to actively stop the driver from controlling the vehicle (like grabbing the wheel). You may file a third-party claim with the insurance company of the driver who was at fault, whether that was your driver or the driver of another car. If you feel awkward about filing a claim against your driver, because they are a friend don’t worry — actually, you’re making the claim with their insurance company. The driver won’t have to pay your damages out of pocket. Their insurance rates may go up, but if they were at fault, this would have happened anyway. 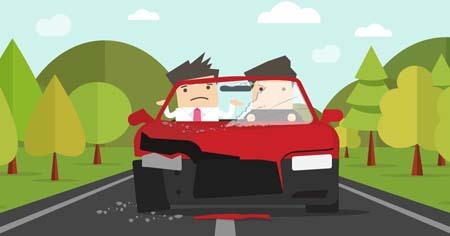 If your driver and the other driver shared fault, then you may file separate claims with both insurance companies. 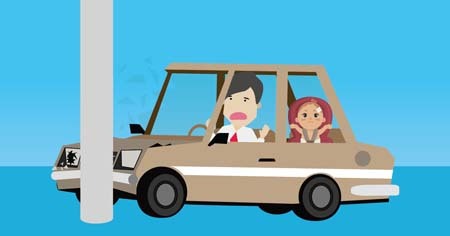 You will be able to collect damages from each driver proportionate to the percentage which they were at fault (for instance, 60% from one driver and 40% from another), although your total amount from both drivers cannot exceed the cost of your damages.If your driver was an immediate family member, and they were at fault, then it may be harder to file a claim against them, but the law in this area is complex and it may be possible. If Someone Borrowed My Car and Got in an Accident, Who Is at Fault? If you’re too drunk or drowsy to drive, then handing over the wheel to a friend is the responsible thing to do. But what does this mean legally? If someone borrows your car, they are also borrowing your insurance coverage. Insurance follows the car, not the driver. When you lend your car, you implicitly consent to assume the risk, because your insurance did not consent to take on a new driver’s risk. If they are in an at-fault collision, your premiums will go up. In some cases, the insurance of the driver who borrowed the car may still be helpful. If the damage from the accident exceeds your policy limits, the other driver’s insurance may kick in as secondary coverage once your coverage has been exhausted. However, although insurance follows the other car, traffic citations follow the driver. If your friend borrows your car and gets a ticket, they will have to pay, not you. And of course, if someone steals your car or takes it against your permission, you will not be held responsible, because you will not have consented to assume that risk. In cases where a car accident has led to the death of a loved one, you may be eligible to file a wrongful death claim or a survival action on behalf of your loved one. Wrongful death claims aim to recover compensatory damages caused by the death of the decedent, including medical and funeral expenses, loss of earnings, loss of inheritance, and loss of society, love, companionship, or consortium. Wrongful death claims must be filed by the personal representative of the decedent’s estate. Typically, this means an immediate family member, such as a parent, child, or spouse, although this varies from state to state, and some jurisdictions allow a broader range of people to sue. Survival actions are similar, but they involve damages which the decedent suffered in the time between their injury and death, and would have been eligible to recover directly if they had survived. Damages in survival actions are paid to the victim’s estate. Aside from this, wrongful death and survival action cases are not all that different from ordinary personal injury claims. The case process is the same, as are the standards for proving negligence. What If a Child Was Injured? For a parent, there is nothing worse than seeing your child in pain. Children cannot file lawsuits in their own name, but if you are the parent of an injured child, then you can file a lawsuit on behalf of your child. If a child wins a personal injury lawsuit, typically, the money will remain in a trust until the child becomes an adult, except for costs such as medical bills which were directly incurred by the parents. Young children (especially those under the age of 7) have a few more protections in the personal injury law system than adults do, as generally they are not assumed to be capable of negligence. Drivers are expected to show a higher than normal duty of care in areas where children are present are likely to be present. Children over 14, however, may be assumed to be capable of negligence, and minors with driver’s licenses are held to the same standard of responsibility as other drivers. What If I Had the Same Insurance Company as the Other Driver? This creates an obvious conflict of interest: if your insurer also represents the driver who hit you, then doesn’t this give them an incentive to work against your claim? Theoretically, insurance companies are supposed to separate the insurance adjusters of both parties in such a situation and ensure that they do not coordinate with each other. In practice, of course, some companies do cheat. If you find yourself in this situation, you need a personal injury attorney more than ever. When you can’t count 100% on your own insurance to be your advocate, that is when you can benefit the most from an attorney whose interest is aligned with your own. One upside to getting in a crash with a driver from the same insurance company is that your insurer will typically waive your deductible. What If the Accident Occurred on Private Property (Including a Parking Lot)? Accidents on private property, such as driveways, private roads, and parking lots, are more common than you may think. Cases involving parking lots, in particular, are both extremely common and difficult to resolve, because cars in a parking lot are typically moving in all directions and the right of way is not always clear. Most elements of a case involving an accident on private property will be the same as in any other type of accident. Drivers have the same duty of care on private roads that they do on public ones, and the rules of liability still apply. After an accident on private property, you must take all the same steps that you should take after any other accident. The process of filing a claim with the other driver’s insurance will be much the same, and the determination of fault will be decided according to the same standards. There are a few elements that are different, however. For one, the police frequently do not respond to accidents on private property. If they do, they usually do not file a report. If the police do not come to the scene, then it is more important than ever to gather your own evidence. For another, after an accident on private property, you should inform the property owner of the accident. They may be able to help your case, especially a security camera captured the incident. Conversely, if the private property owner did not maintain their property, and this caused or contributed to the accident, then you might need to file suit against them. Psychological issues, such as post-traumatic stress disorder (PTSD) are common after a car accident. A psychological injury is just as real as a physical injury, and its debilitating effects should not be taken lightly. Symptoms of psychological trauma can take time to manifest, and can include flashbacks, anxiety, mood changes, nightmares or difficulty sleeping. If you have PTSD or other psychological after-effects, don’t lose hope: there are a variety of psychotherapeutic methods that can be used to effectively treat it. And courts today are willing to recognize the legitimacy of damages related to psychological injuries, including both economic damages (such as psychiatric bills) and non-economic damages (such as pain and suffering). What If the Driver Fled the Scene, or Didn’t Have Insurance? These situations, unfortunately, are all too common. 1 in 8 drivers on the road are uninsured, and a similar proportion of accidents involve a hit-and-run driver. In some big cities, the rate of hit-and-run accidents can be as high as 50%. If the other driver fled the scene, don’t chase after them. This could lead to further accidents or a dangerous confrontation. Instead, stay at the scene and notify the police and your insurance that an accident has happened. You should try to get a thorough description of the driver and their car, including make, model, color, license plate number, and damage done to the vehicle, as well as the physical appearance of the driver and passengers. Write this all down immediately, while it is fresh in your mind. Hopefully, the hit-and-run driver will be caught, but sometimes they aren’t. If you were in an accident with a hit-and-run driver who was never found, you will be in the same position as if you were in an accident with an uninsured driver. Either way, your best option is to file a claim with your uninsured motorist (UM) coverage. When you file a UM claim with your own insurance company, they will work to minimize or deny the claim, just as the other party’s insurance would. In this situation, it is important to have an attorney backing you up. Most serious accidents require the services of a personal injury attorney, but in some minor cases, you might be able to handle the accident on your own. How do you know whether you need a lawyer? As a rule of thumb, if you were not injured in a car accident, or if you suffered only minor injuries that do not require medical attention, then you may be able to handle the case on your own. Your own insurance will help you with any property loss claims, and the other side’s insurance adjusters won’t push back too hard if you do your homework and present your case in a strong manner. The other party’s insurance company is refusing to work with you. Unfortunately, it is the nature of insurance companies to push you the hardest after you have suffered severe injuries, which is also when you are most psychologically vulnerable, and least capable of mounting an effective fight. Not every prospective client has a case. However, we’ve found that many clients have a stronger case than they may initially think. When in doubt, talk to a car accident lawyer! Even if you decide to handle the claim on your own, you shouldn’t feel shy about getting a free consultation with an attorney if you run into a spot of trouble or you get a bad feeling from an adjuster. You have little to lose and you may have a lot to gain. Every accident is a different and many factors can affect the final verdict or settlement. In general, though, the more serious your accident injuries were, the higher the final award will be. Verdicts and settlements in car accident cases can range from a few thousand dollars (below which you are unlikely to find a reputable auto accident lawyer willing to represent you) to multiple millions. Where your case will fall in this range depends greatly on the quality of your representation; if you have a good lawyer, your final result will fall near the top of this range. The largest award that TorkLaw has obtained for a client was a $26 million verdict for an injured pedestrian, which set a record in the state of California in 2014. We have obtained several similarly large judgments and settlements. Of course, most cases, whether they are taken by TorkLaw or another firm, do not result in such a large award. And these clients are not in an enviable position. They have paid a terrible price to get there, either by suffering a lifelong injury or the death of a loved one. Most would happily accept a smaller cash award if only they could regain their health or have their deceased loved one back. However, the value of money to people in this position should not be dismissed. For the permanently disabled, it can mean a much higher quality of life, and for those who have lost a family breadwinner, it can save them from destitution. And even smaller cash awards can make a big improvement in your long-term well-being. 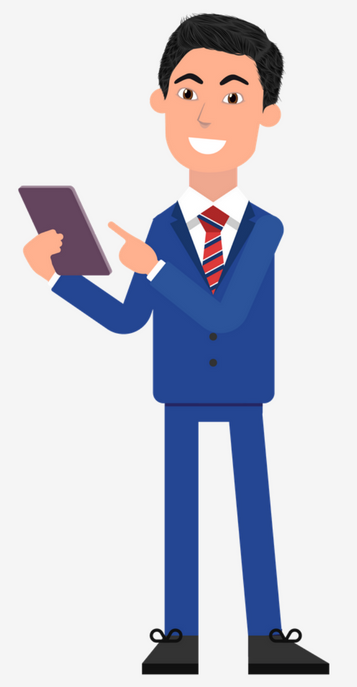 How Do I Know If My Attorney Is Right for Me? Your attorney should be qualified and experienced in the relevant field of law. Most importantly, your attorney should be someone with whom you feel comfortable on a personal level, and who instills a sense of trust. You will be working with your attorney for months or years to come, and you want to be working with someone with whom you are confident you can maintain a positive working relationship. To this end, effective communication is essential. Your attorney should answer your phone calls and emails in a timely manner, give you regular updates on the status of the case, and in general treat you with common courtesy. Should I Trust My Insurance Company’s Initial Offer? No. It is typical for insurance companies to make a “lowball offer” early in the process. This offer might seem adequate or even generous. Your first impulse might be to grab the money and run, rather than embarking on a lawsuit that could take years to resolve with no certain outcome. Many clients take the initial offer and soon find out that what they first thought to be a generous offer didn’t even cover the basics. Don’t accept any settlement offer until you know how the final amount of your damages. Many people assume that they can’t afford to hire a personal injury attorney after an accident, but no matter your income level, you can be represented by TorkLaw. This is because we operate on a contingency fee basis, which means that you pay nothing to us unless we win. If we do win your case, we will be paid an agreed-upon percentage of your judgment or settlement. We also provide clients with top-rate medical treatment on lien, and give access to cash advances, so that if you are in a financially strapped position, we can help. At TorkLaw we believe that everyone deserves to be represented fairly after an accident, no matter how rich or poor they may be. This also allows us to take cases which we might otherwise not be able to take, so we benefit from this arrangement as well as you. Contingency fee arrangements have another benefit: they provide us a direct financial incentive to obtain the largest settlement or judgment that we can: the more you get, the more we get. Of course, a contingency fee arrangement isn’t truly “free,” and you will have to pay if you win. But even after lawyer’s fees are paid, you are likely to receive a significantly larger amount than you would have if you’d handled the case on your own. It depends. A personal injury case can be resolved in a matter of days, or it can drag on for several years. Most cases fall somewhere in between these two extremes, but cases that go to trial tend to take the longest. This can be challenging for clients. However, sometimes it is necessary to get what you deserve. If we at TorkLaw focused on settling cases as quickly as possible, it would mean obtaining substandard settlements for our clients. We would rather put the time and effort into getting a result that matches your damages… and we think that at the end of the day, you would too. Why Should I Hire TorkLaw? Our firm is experienced in representing clients in many types of car accident cases. We have outstanding legal expertise in the field of personal injury law. TorkLaw is recognized by many legal organizations as one of the best in the business. However, the best reason to hire TorkLaw is that we pride ourselves on going the extra mile for clients. At TorkLaw, we understand that every client is someone who needs help, and devote extra attention to helping them get their lives back on track. This makes a quantifiable difference in the results we win for our clients, and an even bigger difference in the satisfaction our clients receive from working with our firm. That is why so many clients are grateful for the results they receive from TorkLaw, and remain friends of our firm. If you’ve been injured in a car accident, call TorkLaw at 888-845-9696. We will listen and give you sound advice. Your initial consultation is free. even if you don’t decide to retain us. We want you to know your rights. Click here for a downloadable, printable version of this guide.